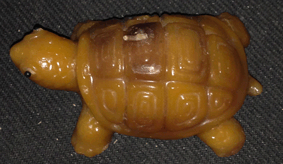 This little tortoise candle doesn't have any stickers or maker's marks. It has never been used. The colors appear to be painted, and there are cracks and age discoloration in the paint. 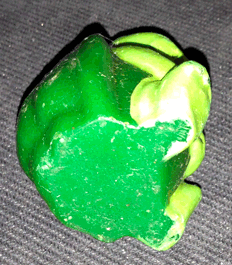 Some of the paint has chipped off in spots, especially on the toes of the feet, revvealing the dark green wax beneath. The details on the face look like decals or stickers. 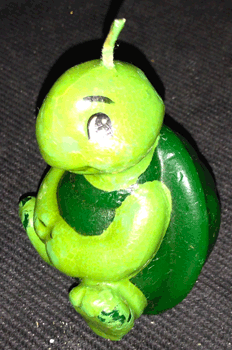 The turtle candle is about 2.5 inches tall, and 1.5 inches wide and long. It weighs 2 oz. This candle is around 30 years old. 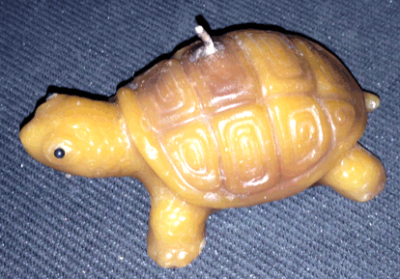 This little tortoise candle has no makers marks or stickers attached. 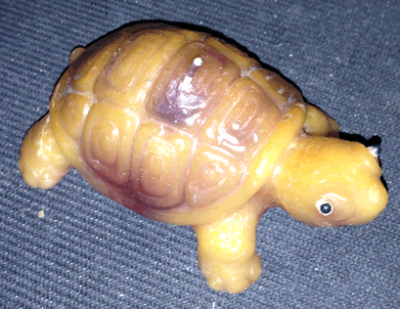 He is over 30 years old, and the colors have changed over time. He looks more of a yellow-brown rather than purple. 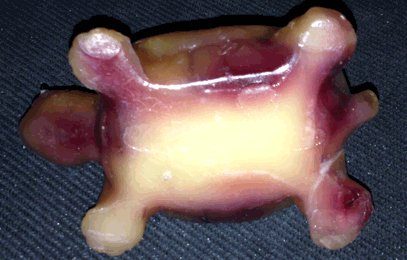 The bottom of the piece which has been exposed to less light looks to have retained some of the original coloration. 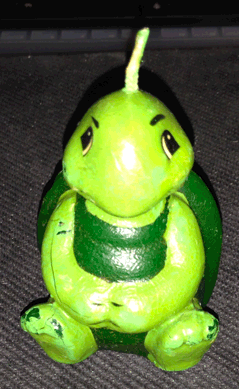 This turtle candle has never been used. It is about 4 inches long and 2 inches wide. 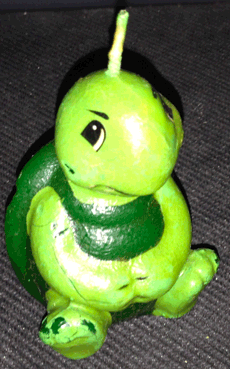 It is less than 15 inches tall and weighs 2.9 oz. 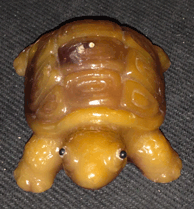 The eyes on this turtle are round black beads that have either been glued on or attached to the wax using heat. It looks like the right back foot has cracked, or broken off completely and re-attached.